Duncan Macfarlan was born in the Manse at Townfoot (Auchengray) 27th September 1771 and followed both his father, also Duncan Macfarlan (1708-1791), and maternal grandfather, John Allan (1737-1812), into the Ministry. He lived in the village until the age of 12 and then went to Glasgow College (University). He specialized in Philosophy and Literature and he gained an MA in 1788 before transferring to a Divinity course. After eight years of study he was licensed to preach by the Presbytery of Dumbarton 28th June 1791 at the age of nineteen and two days before his father’s death at the age of eighty three. Despite being so young he succeeded his father and was finally ordained at Drymen in February 23rd 1792. He continued to study at Glasgow University gaining a Doctor of Divinity in 1806. He did not, however, neglect his pastoral role and was a popular preacher supporting the four schools in his parish. In 1796 he married his cousin Anne Allan of Row parish (adjoining Cardross) when he was 25 and she was 21. His wife died fifteen years later having given birth to 9 children, 5 boys and 4 girls. 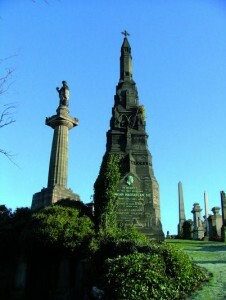 He became Principal and Vice Chancellor of Glasgow University in 1823 at the age of 52 and resigned his post in Drymen. He had to delay taking up the offer the living at Glasgow Cathedral as, in principal, it was unusual to hold two such important public posts. This problem was resolved and he eventually officially took up that post in 1824. He held both these posts until his death some 34 years later. He was popular man in Glasgow and received a testimonial dinner in 1842 “in admiration of the manner in which his various duties were discharged.” One of these duties was to welcome Queen Victoria to Glasgow Cathedral in 1849 and this ceremony is recorded in a bas relief on the pedestal of the equestrian statue to Victoria standing in George Square. When he died in Glasgow, 25 November 1857 he held the title “Father of the Church” and his funeral on 1st December was a public affair with a procession of all the great and good of Glasgow at the time headed by the Lord Provost and the streets were lined with crowds. 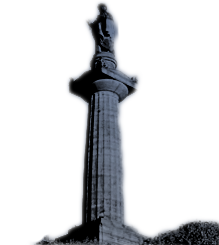 The monument, which stands close to that of John Knox, was erected by public subscription. Duncan Macfarlan 1771-1857, Principal, University of Glasgow, 1823-1857. St Mungo’s Cathedral, Glasgow, 1824-1857. D.D., 1806. Dean of Faculties, University of Glasgow, 1806-1808, 1810-1812. Dean of Chapel Royal, 1820-1824. Moderator, General Assembly, Church of Scotland, 1819 and 1843.